The Porsche Mission E concept will take production form as the Taycan and will be launched some time in 2020, announced as part of Porsche's 70-year celebrations. Porsche's first-ever all-electric car will be officially called the Taycan, the company announced as part of its 70th anniversary celebrations. Taken from a Eurasian dialect, Taycan roughly translates to a 'young, prancing horse', marking an ode to Porsche's iconic crest and logo that features a prancing horse. The Taycan will roll off production lines globally in 2020, and will mark Porsche's first-ever all-electric vehicle. It is also quite a tech-laden affair, with reports stating that the Porsche Taycan will be enabled with Level Four autonomous driving. While details about the Porsche Taycan are still scarce, we do have some knowledge about its powertrain now. The Taycan is being based on Porsche's new, custom J1 platform that is being built ground-up keeping future cars in mind. The structure is said to be different from the other platforms being developed by fellow carmakers like Audi for use in EVs. The batteries, like most EVs, will be placed on the floor, and the added weight should technically lower the centre of gravity for the car, and in turn improve handling and cornering. 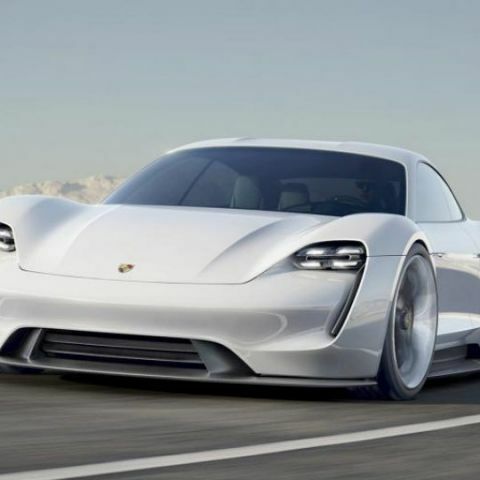 This will be complemented by Porsche's seemingly proprietary 800V charging system, bearing fast charging standard that can juice up the Taycan for 100 km range in just four minutes. There will be two electric motors - one on each axle, facilitating all-wheel drive. Total power output is expected to be around 600 bhp, and net driving range of 500 km. The overall weight distribution car is expected to be equal, thereby making it more stable around sharp pins and curves. This will also improve overall performance, and while Porsche has not revealed final figures, expected acceleration figure for 0-100 kmph will be below 3.5 seconds, and it will take less than 12 seconds to accelerate to 200 kmph. To complement all this, Porsche will reportedly equip it with a more mature version of the Porsche Communication Management (PCM) synced with advanced driver assistance systems (ADAS). The level of equipment onboard the Porsche Taycan will reportedly facilitate Level Four autonomous driving, which will enable a car to drive by itself without active human intervention or assistance. The Porsche Taycan has been earmarked for launch in 2020, and the announcement was made to mark Porsche's 70 years of motoring achievements. The company has also unveiled a next-generation Speedster Concept of the iconic 911 as part of its celebrations, which you can read about here.